Always a Good Time Brewing! Steer a course for the River Pub on the banks of the mighty LaHave! There's always a good time brewing so grab a few friends and set sail for our cozy, relaxed atmosphere. The River Pub boasts a wonderful licensed patio directly overlooking the River and when weather permits, it is one of the most enjoyable locations on the South Shore to dine or relax with friends. 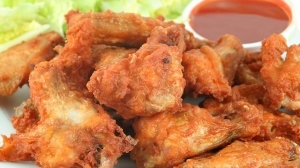 We are well known for our menu and are regularly complimented on our food! 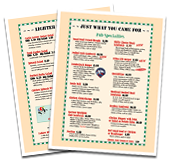 You'll find all the pub classics as well as specialty dishes like the Mariner Mouthful, Rosie Melt, Lunenburger, Potachos, and the list goes on. Take out is even available if you prefer to enjoy your favourite dish at home. 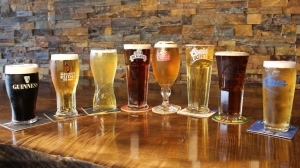 Compliment your meal with a glass of River Pub Ale or one of the seven other draught beers on tap. A well stocked bar of domestic and imported beers, wine, and liquor caters to just about every taste. 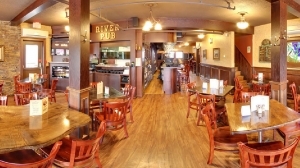 Upstairs at the River Pub is our Banquet Room which can accommodate larger gatherings or private parties. Just ask us for details. Of course the River Pub just wouldn't be the same without our dedicated and friendly staff, many of whom have been working at the pub for 10+ years! That's a sign of a good working environment and that staff know how to treat customers. We thoroughly enjoy making new friends and invite you to drop by the River Pub!